Marco Blaauw has an international career as a soloist and is a member of the Ensemble Musikfabrik in Cologne, Germany. Important focus for Marco Blaauw has always been to further develop the trumpet, it’s playing technique, and to initiate new repertoire. Blaauw works in close collaboration with composers of our time. Many works have been written especially for Blaauw, including compositions by Peter Eötvös, Georg Friedrich Haas, Wolfgang Rihm, Rebecca Saunders and John Zorn. Blaauw worked intensely with Karlheinz Stockhausen. Flying over the orchestra in a gimbaled cage, he played the leading role in Stockhausen’s MICHAELs REISE. He presented the premier of HARMONIES for trumpet for the BBC Proms at the Royal Albert Hall and has premiered many solo roles from the opera cycle LICHT. In 2015 he started working with La Monte Young on “the Second Dream of the High Tension Line Stepdown Transformer”. Since than he produced many concerts to share La Monte Young’s groundbreaking work for audiences in Europe. As a composer, Blaauw was awarded the 2016 Karl Sczuka Prize (support grant) for his first radio play, “deathangel”. Blaauw has been intensely active as a teacher, f.e. in international master classes and most recently a master’s program at the Royal Conservatory in The Hague. Since 1993 Marco Blaauw is member of Ensemble Musikfabrik, one of the leading ensembles for contemporary music . The group of 16 international soloists take all business- and artistic- decisions as a collective. Next to their outstanding performances of conducted ensemble repertoire, the ensemble developes interdisciplinary projects, solo- , chamber- and ensemble music repertoire, and works using open form and improvisation. In June 2019, LICHT, a major part of seven operas composed by Karlheinz Stockhausen, will be performed in a single programme, designed by Pierre Audi. This mega project, the largest-ever operatic production, is a joint production of the Royal Conservatoire, the Dutch National Opera and the Holland Festival. 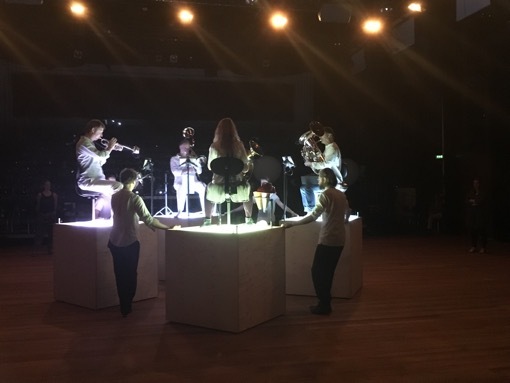 This master program at The Royal Conservatoire The Hague offers a chance for a new generation of musicians to reimagine the monumental work of Karlheinz Stockhausen. Marco Blaauw is member of the faculty, starting in September 2017. “Our most basic common link is that we all inhabit this planet. We all breathe the same air”. 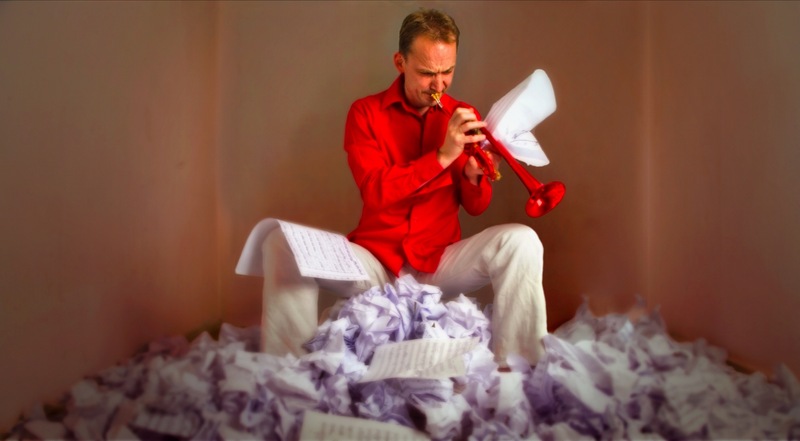 Global Breath is an international research and concert project comparing the archaic role of the trumpet with its use by pioneering trumpet players today. Supported by the Kunststiftung NRW and the Société Gavigniès, Blaauw works with a small team on the realization of this project. Is the sound of the trumpet a basic common link between humans? 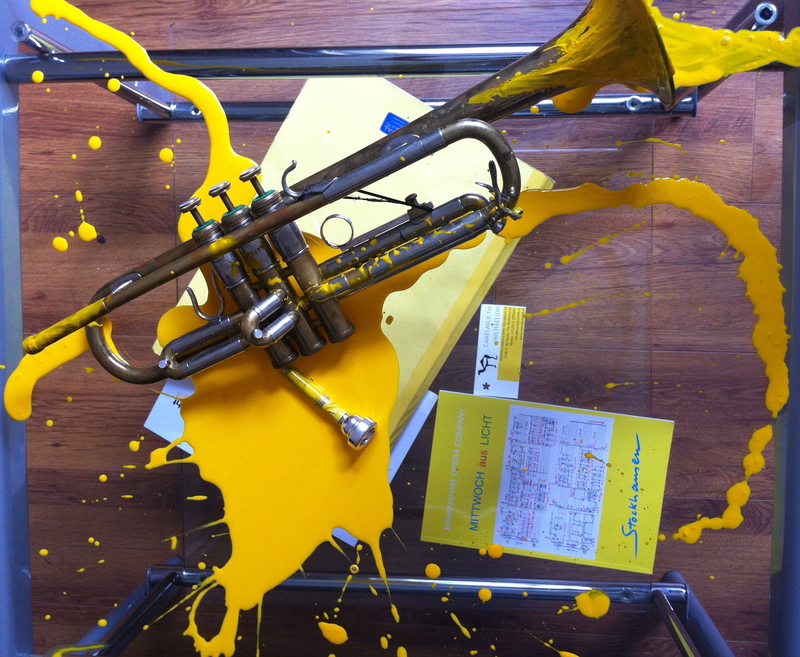 Searching worldwide we are interviewing trumpet “pioneers” who have achieved iconic importance on the instrument. Global Breath serves to create a recording archive of the iconographic sounds, as well as a video archive of the interviews. 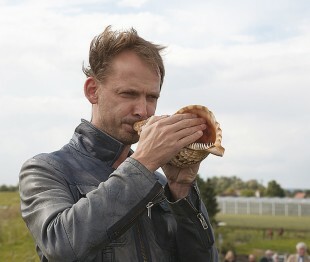 Inspired by the work with La Monte Young, Marco Blaauw started an ensemble for multiple trumpets, exploring the huge variety of trumpet sounds and playing techniques. In January 2015, they worked closely with La Monte Young and Marian Zazeela in their New York Dream House, gaining deep insight in the work and performance practice. After 2 initial performances in the Chelsea Dream House, NYC, the ensemble played performances i.a. in Warsaw, Huddersfield, Paris, Oslo, Amsterdam, Krems, Cologne, Polling and will continue sharing La Monte Young’s groundbreaking work for audiences in Europe in coming years. Composition 103 (For Seven Trumpets) features notated music and choreography for seven costumed instrumentalists. Written in 1983, the composition fully exploits the sonic potential of the trumpet: timbral shifts with multiple mutes; sharp articulations contrasting with breathy gestures; half-valved squeezes and virtuosic runs; and ringing unisons, harmonies, and clusters basking in the rich brass overtones. Even the choreographed movements are specific to the instrument, not just manipulating the directionality of the sound, but also referencing the Groucho-inspired stagger of Braxton’s old comrade Lester Bowie. First performances scheduled in autumn 2018.
through old traditions of free improvisation and contemporary exchange with composers of our time, Blaauw keeps developing performances and repertoire. Most recent: Julien Jamet, (Glossomanie), Rebecca Saunders, (i.a. YES for ensemble, White for trumpet solo), Georges Apreghis (Intermezzi for 15 soloists), John Zorn (Merlin), Georg Friedrich Haas (I can’t breathe), improvisation duo’s with Marcus Schmickler, Gijsbrecht Roije and Yannis Kiriakides. “THE OTHEROOM” is a collaboration between choreographers Heine Avdal (NO/BE) and Yukiko Shinozaki (JP/BE), composer Rolf Wallin (NO/UK), and co-composers/ performers Marco Blaauw, Christine Chapham, Bruce Collings, Melvyn Poore. In THE OTHEROOM the audience is entering a ritual, the purpose of which is unknown to them, but clearly of utmost importance for those involved. Everything moves. There are no chairs, the audience is free to move or being moved. Elements of the room, the theatre, become part of the ritual, the movements, and serve as physical manifestations of the musicians’ thoughts and their interactions. Each musician is seated on a high mobile “pedestal”. Four dancers move the pedestals with the musicians around in the performance space, arranging them in ever new geometric constellations. It is apparent that Blaauw has the technical and musical prowess to perform these contemporary works with conviction and musical expression. All these works challenge the trumpeters range, flexibility and endurance, yet Blaauw manages to perform with grace and ease… (John Burgess). Met Zimmermanns trompetconcerto ‘Nobody knows the trouble I see' kregen we de fenomenale speeltechniek van de trompettist Marco Blaauw erbij. Zijn loepzuivere intonatie, de ragfijne details en zijn vermogen om zelfs in de meest verstilde passages iedere toon secuur neer te zetten, gaven het concerto een intense gloed. Whatever the material, Blaauw’s readings have a lot of space and dynamics, and always a crystal clear tone that he occasionally ruffles and musses…. It’s a different kind of solo recording, a rich feast. ...wie Marco Blaauw als Michael-Trompeter inmitten des teuflischen Orchestertreibens von Luzifer in einer Solokadenz um das Schöne und Vollkommene rang, das berührte zutiefst: Für einen Moment schien die Zeit stillzustehen. Eötvös’s Snatches of a Conversation, Playing a double bell trumpet, which allowed him to alternate rapidly between different mutes, Marco Blaauw transcended the work's limitations and illuminated its strengths. de oermuzikale Blaauw kan klanken produceren waarvan je het bestaan niet had vermoed, maar hij is ook een poeet. Vooral deze kant krijgt op Angels alle vrijheid. “Blaauw” (“Blue” in Dutch.) Blaauw took us on a journey of various sounds and textures - strident moments, far-off echoes, doubling effects...a mesmerizing work of small sections, well punctuated, very introspective. Harmonien, a fifteen-minute trumpet solo episode from the Fifth Hour (a BBC commission receiving its first performance in the Royal Albert Hall): a series of twenty-four melodies...a dazzling performance by Marco Blaauw. Only Stockhausen would have dared it...a lone trumpeter came on to the platform and, in between long burnished notes, announced, word by word, the phrase "Lob sei Gott!" - "Praise your God!" HARMONIEN (‘Harmonies’)...was an opportunity for solo trumpeter, Marco Blaauw, to shine and he took it – with mesmerising musicality, theatricality, and virtuosity. LUZIFER’s TANZ: Blaauw’s alternation between unmuted and muted trumpet, to which certain extended techniques were added, was as flawless as one would expect, yet nevertheless deserving of comment. His unsuccessful – dramatically, that is – yet impressive soliloquy marked an especial highpoint. Insane Climax of minimal Music Festival! 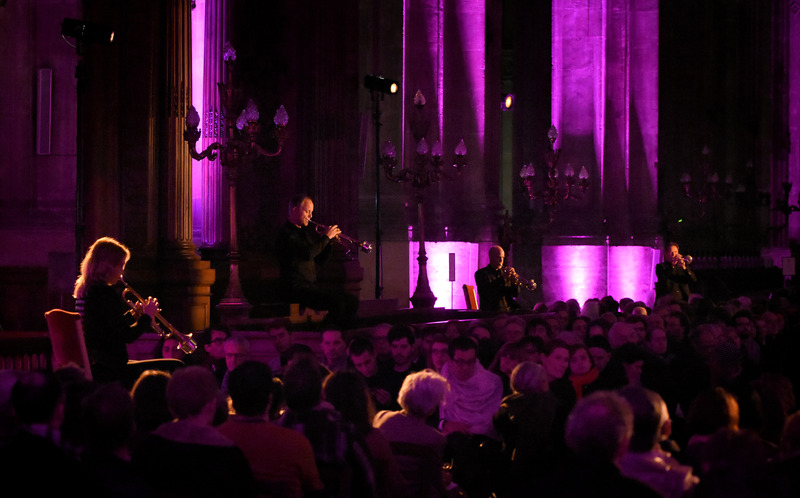 The Second Dream of La Monte Young was easily the highlight of the fifth edition of the World Minimal Music Festival. …The soloist Marco Blaauw was outstanding…managing to communicate Michael's raw rage and indignation even as he was playing lying on his back. 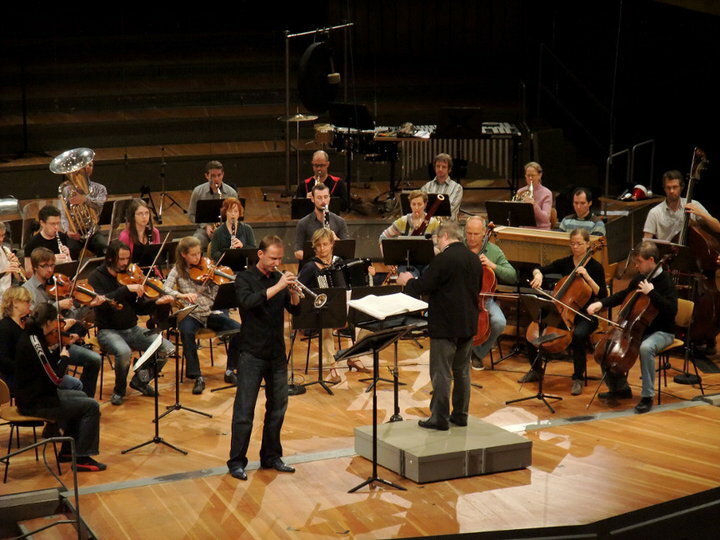 Marco Blaauw, who swooped bravely about the stage atop a moving crane, trumpeted fearlessly in the title role. Marco Blaauw, the high-flying hero of Ensemble musikFabrik's Michaels Reise at the Lincoln Center Festival last summer, has a riveting new CD called Angels, containing "sound images of winged creatures"
in two different festivals in the space of a month. From memory (naturally), in both cases. The idea that a single musician could somehow shoulder the gargantuan weight of these ‘titans’ and their verlags is something to contemplate. Angels: 10 pieces all feature one or more trumpets, with the remarkable playing of Marco Blaauw as the focus...with the huge range of weird and wonderful sounds that Blaauw can extract from his instrument.